Lupine (Lupinus) is an unusual looking plant with medium-green leaves and long, upright flower spikes. 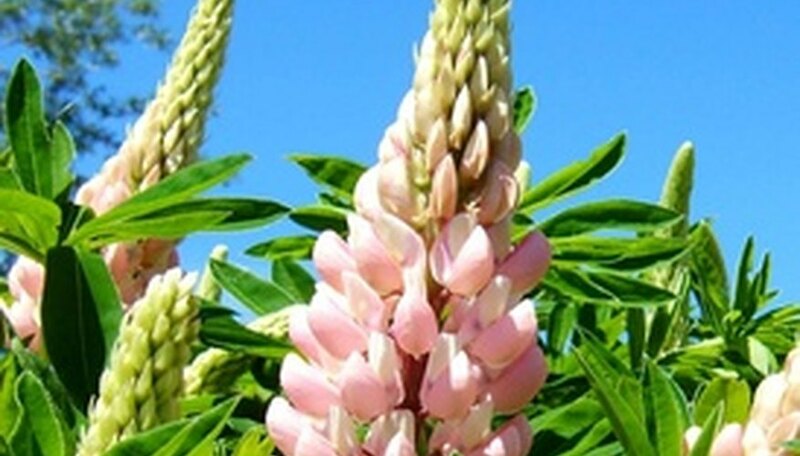 Lupine is available in a variety of shades, including purple, dark blue, pink, yellow and white. The foliage of this plant grows from 1 to 2 feet tall while the blooms sometimes reach heights of up to 4 feet. Lupine does well in most growing conditions, although it will not live if planted in heavy soil. Lupine grows wild in many regions of both North America and Europe. Place the desired number of lupine seeds into a moistened paper towel. Place the paper towel inside a plastic bag and put in the refrigerator for seven days. Prepare the planting site by removing all grass, weeds and rocks. Use a garden fork or tiller to loosen the soil to a depth of 12 to 20 inches. Sow the seeds liberally, and cover with 1/8-inch of soil. Water until the seed bed is moist, but not soggy. Be careful not to submerge the seeds more deeply than recommended when watering. Water whenever the top inch of soil is dry to the touch. Thin the seedlings once they have all emerged, leaving a space of 18 to 24 inches between each plant. Fertilize once each month with an all-purpose organic fertilizer. Clip off faded flowers regularly to prolong the blooming cycle. Examine the plants often for signs of insect infestation. Aphids are the most common insect to attack lupine. Treat promptly with insecticidal soap if you suspect a problem. Lupine does best when planted in full sun. Lupine plants can also be propagated by cuttings or division. Lupine plants rarely survive transplanting.